Occupying a central location close to the town Centre, Number 69 Charlotte street baosts three bedroom, two recption accommodation, Oil FIred Central Heating, Double Glazed Windows and enclosed rear garden with two concrete construction stores. In need of a touch of TLC, this is an excellent opportunity for the investor or buy to let purchaser and is priced accordingly. We expect keen interest. with laminated flooring, telephone point, ceiling coving. with WC, wall hung sink and splash back. with feature art deco fireplace, bay window, laminate flooring. with art deco fireplace, laminate flooring, ceiling coving and rose. with eye and low level units, tiling between, single drainer stainless steel sink unit, space for cooker, extractor fan, uPVC wall cladding. with coloured suite comprising; panel bath with mains fitting over, WC, pedestal wash hand basin, fully tiled walls, hot press. Front garden enclosed by low level wall and pedestrian gate. Rear garden with raised beds and mature planting, concrete patio area, two concrete consturction stores, outside tap. 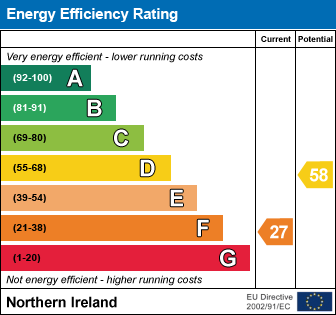 I am interested in 69 Charlotte Street, Ballymoney. Please contact me about this property.